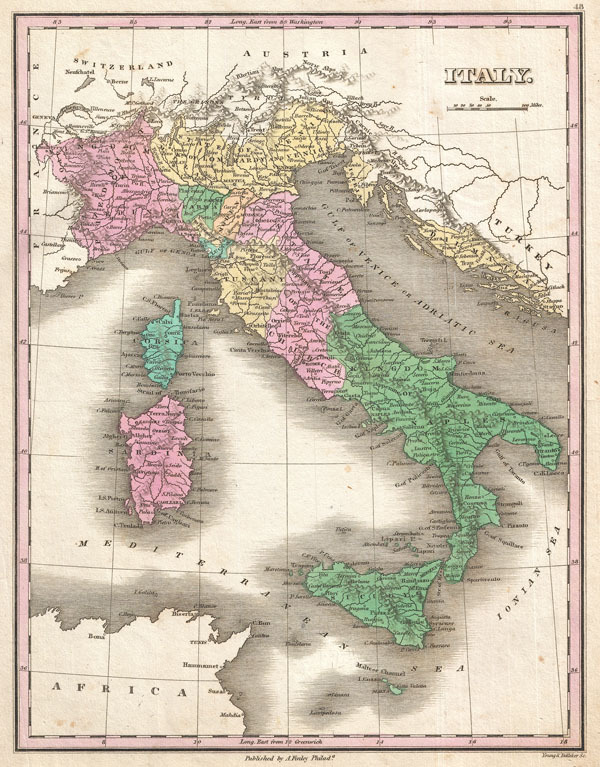 This is Finley's desirable 1827 map of Italy. Depicts the Italian peninsula from Austria and Switzerland to Sicily and Malta. Includes the Islands of Sardinia and Corsica as well as Dalmatia across the Adriatic. Shows river ways, roads, canals, and some topographical features. The predates the Italian solidarity movement and consequently, the peninsula is divided into an assortment of kingdoms, duchies, republics and states. Color coding defines traditional regional divisions. Mile scales and title in upper right quadrant. Engraved by Young and Delleker for the 1827 edition of Anthony Finley's General Atlas. Rumsey 0285.049 (1831 edition). Phillips (Atlases) 4314, 760, 752, 6045.